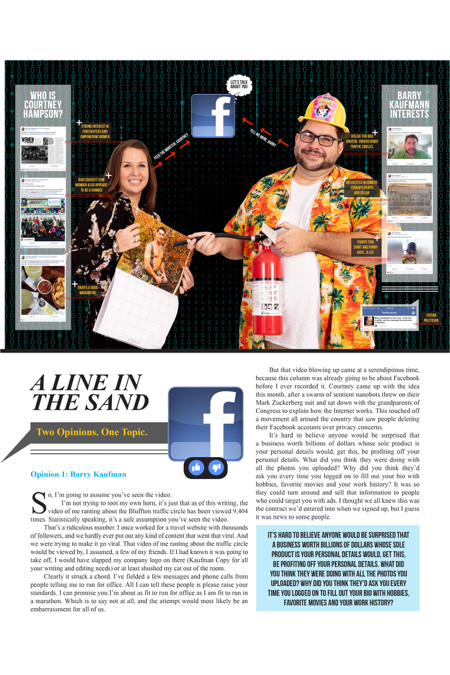 Hilton Head Magazines: CH2/CB2: Line in the Sand: Facebook... Should I stay or Should I go? So, I’m going to assume you’ve seen the video. I’m not trying to toot my own horn, it’s just that as of this writing, the video of me ranting about the Bluffton traffic circle has been viewed 9,404 times. Statistically speaking, it’s a safe assumption you’ve seen the video. That’s a ridiculous number. I once worked for a travel website with thousands of followers, and we hardly ever put out any kind of content that went that viral. And we were trying to make it go viral. That video of me ranting about the traffic circle would be viewed by, I assumed, a few of my friends. If I had known it was going to take off, I would have slapped my company logo on there (Kaufman Copy for all your writing and editing needs) or at least shushed my cat out of the room. Clearly it struck a chord. I’ve fielded a few messages and phone calls from people telling me to run for office. All I can tell these people is please raise your standards. I can promise you I’m about as fit to run for office as I am fit to run in a marathon. Which is to say not at all, and the attempt would most likely be an embarrassment for all of us. But that video blowing up came at a serendipitous time, because this column was already going to be about Facebook before I ever recorded it. Courtney came up with the idea this month, after a swarm of sentient nanobots threw on their Mark Zuckerberg suit and sat down with the grandparents of Congress to explain how the Internet works. This touched off a movement all around the country that saw people deleting their Facebook accounts over privacy concerns. It’s hard to believe anyone would be surprised that a business worth billions of dollars whose sole product is your personal details would, get this, be profiting off your personal details. What did you think they were doing with all the photos you uploaded? Why did you think they’d ask you every time you logged on to fill out your bio with hobbies, favorite movies and your work history? It was so they could turn around and sell that information to people who could target you with ads. I thought we all knew this was the contract we’d entered into when we signed up, but I guess it was news to some people. And those people were starting to delete their Facebook pages. I say starting to, because I can’t help but notice a lot of people announce their intentions to delete Facebook, before going on to do exactly not that. Because as insidious as it is, Facebook is just how we all communicate right now. It’s like saying you’re going to delete your ability to make phone calls. I get it, though. Privacy concerns aside, Facebook has become kind of a wasteland lately. After the election, I found myself putting a few people from both sides of the aisle on silent mode who just wouldn’t stop with the memes. What was left was the same handful of people just sharing moments of their life or maybe trying to rope me in to their multi-level marketing scheme. These were the people I was trying to reach with that video. It turned out that outside my own little echo chamber, there are quite a few people who also didn’t delete their Facebook. And those people, it turned out, shared my view that maybe you’re all just the worst at driving. When there’s so much dividing us as a country right now, it is refreshing to see you can still use this platform to spread a message we can all get behind. Namely, that you should all learn to drive. It’s a message I’ve written about countless times and, in fact, that rant is more or less recapping something I wrote in this very space a few months back (December 2017). But once a column is written, I never really see if it landed. I may get an email or a phone call once in a while, but that’s it. With this, I can see that it hit a nerve; I can read people’s reactions in real time. Just in the span of me writing this, 35 more people have watched it. And ultimately, it did what Facebook is supposed to do. It connected a lot of people who felt the same way with a community of like-minded people they didn’t even know existed. The swarm of nanobots would be proud. In addition to her obvious disregard for grammar and punctuation, perhaps her greatest sins are her mean spirit, lack of social awareness and empathy, and addiction to game shows and soap operas. JG, I hope you read this column (in fact, I am probably going to send it to you), because you are everything that is wrong with Facebook. You are despicable. But you already know that, because more than 1,800 people have commented on your post. You are the perfect evidential support for why people want to delete Facebook and never look back. That was my plan—a part of my I-am-turning-45-this-year-and-my-life-change-will-be deleting Facebook. Until … the night before the day a Puerto Rico National Guard plane went down on a Savannah highway, erupted into a ball of flames, killed the nine service members on board, and a woman by the name of JG posted a heartless message on the WTOC-TV Facebook page. They almost had me. In fact, if JG hadn’t been a blatant a-hole the next day, I may have stayed. Oh, I’ve come up with every excuse for why I shouldn’t delete my Facebook account. But in the end, on the days before the night before the day a Puerto Rico National Guard plane went down on a Savannah highway, erupted into a ball of flames, killed the nine service members on board, and a woman by the name of JG posted a heartless message on the WTOC-TV Facebook page, I am reminded of why I had convinced myself that my 45th birthday present to myself was to be Facebook-free. As I pen this, I am 11 days out from said birthday and 26 days from this issue landing in your mailbox.